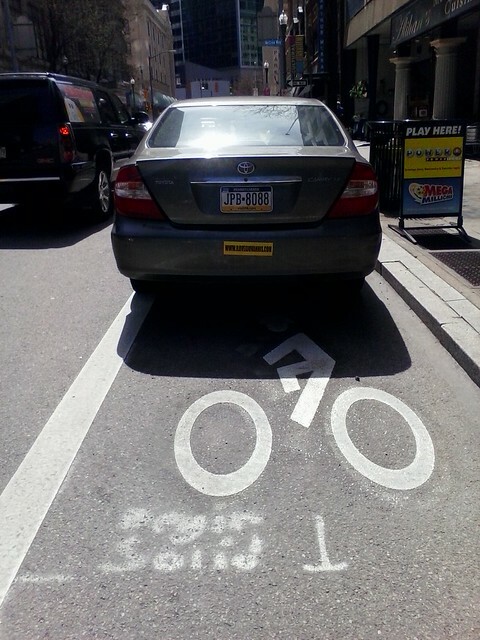 On Penn Ave by Heinz Hall, Saturday 4:30pm, a car had just entered the bike lane. We talked to the driver and he backed up, quite apologetic. Something needs to be done as this is the second time I’ve seen a car enter the bike lane at 6th St out of 10 recent rides on Penn Ave. Better signs, or paint on the road, are needed to make it clear this lane is not for cars. Yes, a bollard (flexible, so a cyclist bumping it wouldn’t get hurt) would be a GREAT improvement. A bollard would be far more effective at keeping cars out than signs or more paint on the road. The latter two are often ignored, as we’ve seen. There are signs everywhere. People are stupid. This is the same as the drivers who go the wrong way down the one way street on which I live. Even bright neon signs won’t make them stop. They need to put bollards up so that people can’t go into othe bike lane without damaging their vehicles. Though I am afraid that even a physical barrier may still not be enough. There were bollards at all intersections up until December, I think. They were removed to facilitate snow plowing. I just did a 311 to get them re-installed. The bollard at I think 12th St. is there, and kinked at about a 30° angle from being clobbered so often. The bollards were removed so that the lanes could be plowed and they should be put back very soon. 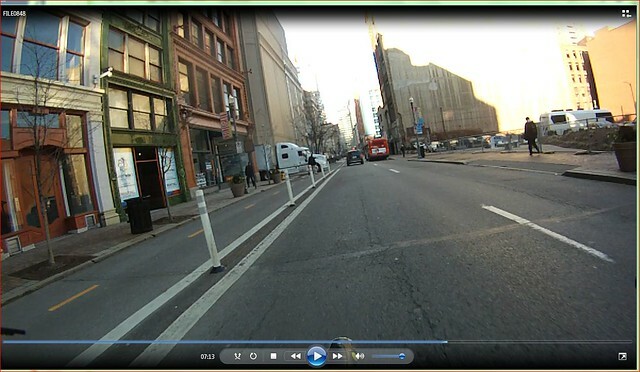 > The bollard at I think 12th St. is there, and kinked at about a 30° angle from being clobbered so often. So they could be plowed, ha. I think they forgot the memo to plow the bike lane, all winter. There were times when there was ZERO snow in the city, except the bike lane. They absolutely were plowed though they were treated as low priority such as a tertiary road. It also doesn’t help that some of the property owners along the bike lane shovel all of the snow from their sidewalks into the bike lanes. 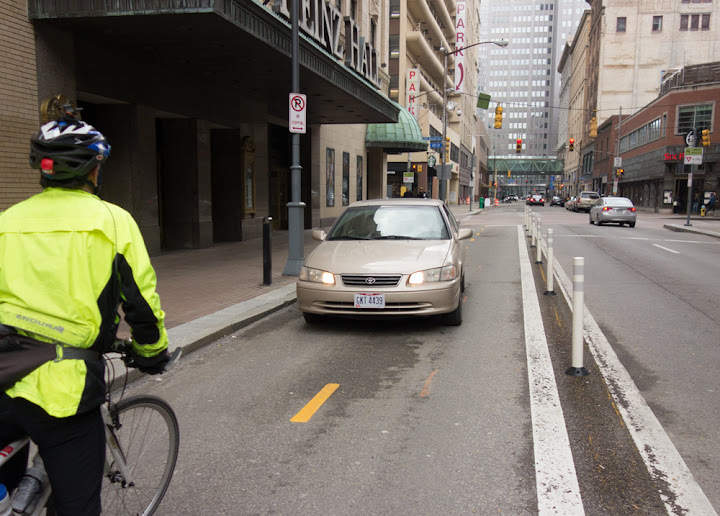 Am I the only person who always has to deal with people telling me to get into the bike lane when traveling Penn Ave to Point State Park at Penn/6th. I move out of the bike lane, signal and get in the lane to go straight on Penn where the bike lane ends. It has had to have been more than 10 times now that somebody says, “Derpidy derp, there is a bike lane there.” I have to respond that I am going straight where the bike lane ends. It is just obnoxious. @shooflypie, yep this has happened to me, too. It’s an awkward transition, but it would be less problematic if, during a red light, drivers actually stopped at the white line on Penn that’s maybe 50 ft before the intersection, as opposed to at the intersection itself. Obviously this doesn’t do anything for when the light’s green, but whatever. I just brush it off. In any case, this will be moot once the bike lane is extended all the way to Stanwix, assuming that’s still the plan. Although this may be delayed yet again, since there’s still problems with underground water/sewage pipes on the 500 block of Penn. Last week, one of these pipes burst, which is why there’s metal covers on that side of the street. i heard the center bollards were supposed to be reinstalled yesterday – did that happen? The center bollards have been reinstalled. (a) Restrictions.–No driver or owner of a diesel-powered motor vehicle with a gross weight of 10,001 pounds or more, engaged in commerce, shall cause and no owner or operator of the location where the vehicle loads, unloads or parks shall allow the engine of the vehicle to idle for more than five minutes in any continuous 60-minute period, except as provided under subsections (b) and (c). @chrishent: right, my truck picture from 2014 was from Benedum, not Heinz. I misspoke. Not that I am not annoyed by these trucks, but idling can be related to cargo refrigeration (which is an exemption in the section C of the above quoted document). Even if one assumes the truck driver doesn’t give two hoots about the environment, diesel fuel costs money. Marko82’s link says that vehicles with a sticker from California saying they meet a certain NOx idling emission standard are exempt from the anti-idling law. If Clark Transfer is as green as they claim, perhaps their vehicles have such a sticker? Trucks in the bike lane, methinks we doth protest too much. 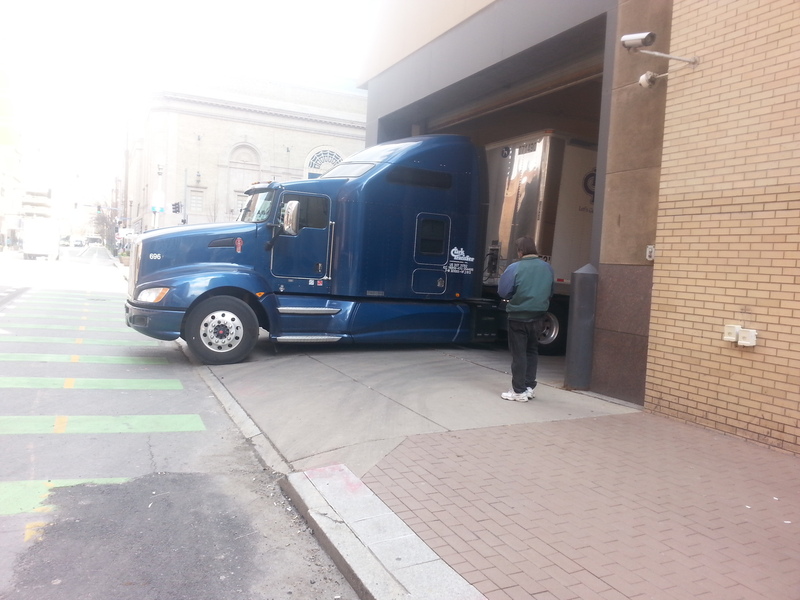 Sorry, but the Benedum can’t do too much about where their loading dock is, or how long the trucks that service it are. As a regular reader of the blog of the Prairie Home Companion’s truck driver, who often opines about the ease (or lack of same) of getting their road show’s stuff in and out of any given city’s venue, they really don’t have much say in the matter, and if it blocks traffic, it blocks traffic. Inbound, just use the traffic lane (and to hell with anyone who complains about it). Outbound, just watch yourself getting around the truck. I think it’s a legit issue Stu. ToBeSure, as they say, if there’s a need to park a truck there for an hour for an actual load/unload – I understand that. But they park trucks and block the bike lane overnight and all day – and that’s no good. We didn’t agitate and advocate for years for bike lanes “unless any truck owner wants to park there”, in which case “nevermind”. I don’t take up a space in the truck parking lot, they don’t get to block my bike lanes unless it’s very short-term and used for actual loading/unloading. This a regular issue. They can’t force pedestrians and cyclists out into a dangerous situation for several hours a day. EVERY day. A: move their loading dock further back to accommodate a trailer and truck. This morning, I had a man yell at me to “Get in the bike lane!” while I was maneuvering around the truck AGAIN. It was sitting there on my way in at 7:55 and again at 8:30 when I returned. Not only is the bike lane blocked and full of pedestrians, but I’ve got some dude on the other side of the street giving me lip about it. There’s traffic counting wires on the Penn Ave lanes. I saw them in front of Heinz Hall and then between 9th and 10th. There’s probably one or two more before the lanes reach the Strip. It was only a matter of time before these were put in. No need to pump up numbers, Downtown and the Strip is absolutely nuts with recreational cyclists of all ages and abilities. Grannies, kids with training wheels, Freds, soccer moms. Holy crap I was speechless at the numbers of people using the new bridge and bike lanes. They LOVE the bike lanes. They’re having issues connecting the bike lane from Clemente/6th because it is BLOCKED with parked cars and no bike box yet. Like I mentioned in another thread, this block of 6th St has always had “No Parking” signs, that were disregarded in general. I think they are delivery drivers for some of the restaurants on that streets. Have any tourist-types been confused where the Penn Ave bike lane just STOPS where oncoming traffic is moving towards you at the 16th street bridge? 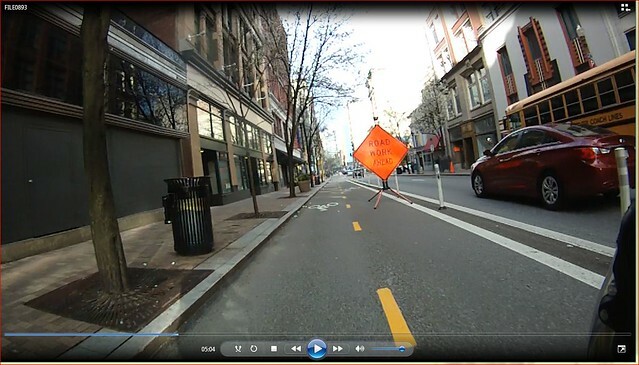 The way they have the markings from the bike lane going from there into the middle of Penn Ave (obviously for people going INTO town) — I can’t help but think someone is going to follow the markings right into an oncoming car’s hood. I’ve seen more than one person DRIVE through that intersection back before the bike lanes were there — before realizing the mistake they made… So I expect this will happen sooner or later. Re: The stretch of 6th from Penn to the Bridge, seeing as how that stretch includes the drop off area for the Renaissance Hotel, that area requires a different treatment than other typical streets w/bike lanes. People travelling in all modes are going to need to deal with mixing and coexisting in that area, as well as unfamiliar visitors. I’m thinking of a treatment similar to Market Street in front of the Fairmont. The street design in that block makes it apparent that it is not a purely vehicular street, nor a purely pedestrian street – the design makes it “feel” different, and makes it clear that you do not travel through in a typical “vehicular” way. The northbound stretch of 6th St is not an issue. That lane is sharrowed, as there is a taxi stand, hotel dropff and a bus stop all on that block. The southbound lane has the bike lane and it has issues with illegal parking. It always has. Personally, sharrows on both lanes would have been fine with me, but I suppose they added the bike lane southbound to provide a friendlier connection between the Clemente bridge bike lanes and the Penn Ave cycle track. Short report. I went on my lunch ride around 1pm through EFT, Oakland (to get a crepe for lunch) to 5th, downtown, Penn. So I was at Penn around 1:45pm. Counted around 30 people on bicycle: 8 were going out, 22 in. Turned around at 16th and counted again. Another 8 people. This is for about 18 minutes. And only one red light runner. Red, I got a pic of that last night too. Sent it to 311 via twitter. No response yet. Almost got killed by a giant box truck that turned left across my path and pedestrians crossing the street at 11th and Penn. If I hadn’t stopped I would’ve ended up right under the back tires. I was visibly upset by it but it didn’t seem to phase the pedestrians at all since I guess you just get used to people doing that downtown.